My sister, Veronica, introduced me to this tasty creation. Its a surprising mix of flavors that simply works! If there are individual’s in your house that avoid too much heat, keep the nuts on the side, but in my opinion they make the salad! Enjoy! For the dressing, shake all the ingredients together in a mason jar until well combined or run them through a quick blender cycle. Store in the refrigerator until ready to serve. The dressing can be made up to a week in advance. For the nuts, lightly toast the nuts in a 350 degree oven for 8-10 minutes, checking often so they don’t burn. While they toast, place the sugar, cayenne and salt in a skillet over medium-low heat. Cook the sugar mixture until it liquifies completely, adjusting the heat so it doesn’t bubble and burn. Toss in the toasted nuts and stir to coat the nuts with sugar. Let the sugared nuts cool completely. 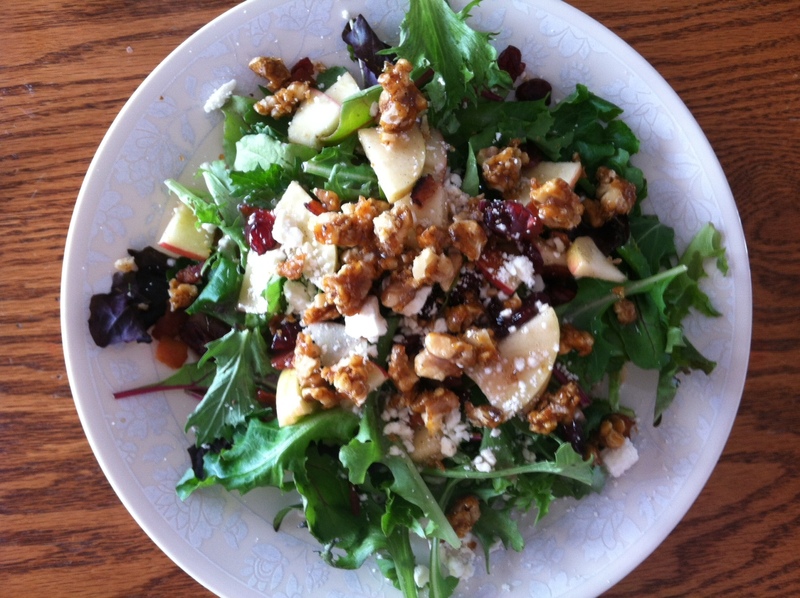 To assemble the salad, toss all the salad ingredients together along with the cooled nuts. Serve immediately with the vinaigrette alongside. All the components can be measured out/prepped ahead of time and stored separately (Soak the apples in a bit of lemon juice in water to help prevent browning). Toss right before serving. Tags: Ladyfood, Lunch, Salad. Bookmark the permalink.